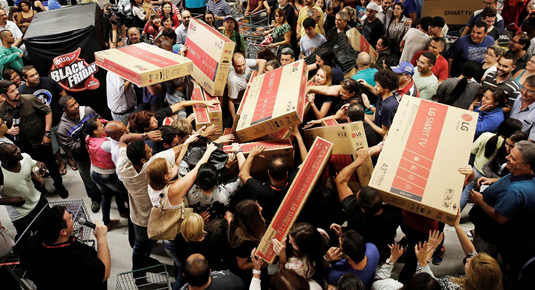 Do you know why the Friday after Thanksgiving, in the USA, is Black Friday? It’s because that's the day retailers make 50-70% of their profits for the year; hopefully, in the black as opposed to the red. Does that mean many are losing money or breaking even the rest of the year? My favourite sales are the so-called Door Busters. These ostensibly super specials entice customers into the store, at a specific time, usually early in the morning or late at night. That mattered before retailers started putting their catalogs on line, letting people shop from the comfort of their home instead of having to venture out on Thanksgiving evening. Last year I spent some money at Kohl's on Thanksgiving night, after getting home from our dinner. I ordered four dress shirts at $7.50 each; four flannel shirts at $9.99 each and two pairs of New Balance sneakers at $29.99 each. Then I got 15% off the total order, with free shipping. The dress shirts and flannels are normally $19.99 each and the sneakers $69.99, usually on sale for $49.99. Do the math. Large savings were a gift. This year, I ordered another four dress shirts, two flannels and one pair of New Balance sneakers. The total with tax was $71. I think that was a successful shopping spree. I should have all the items delivered sometime this week. One other thing I get every year is Norton Security Deluxe, usually at Staples or BJ's Wholesale Club. This year, BJ's had the best price of $29.99 for ten licences; Staples wanted $19.99 for five licences. I need the extra licences for my desktop and laptop, two laptops for my daughters; one for my Samsung Smart phone and the desktop my father-in-law uses. That's six licences and I may put it on the new iPad, which I also got at BJ's. Their regular price was lower than most sale prices and I just got the new savings book; the price went down by $20. On Tuesday, I'll go get that price adjustment and buy some cat food, with the discount, which is like getting the cat food free. We have a new Google Mini Home. My wife got a Google Home Mini at Bed, Bath and Beyond. It just went on sale. She received the lower price and $10 gift card, too. Now, I must find the time to set it up. It's been sitting in the house for over a week. Melissa wants to name it Alexa. I told her to buy her own Amazon device and she can call that Alexa, leave mine alone. I love a sale as much as does anyone else. I will always ask for a better price or discount, if I can get away with it. I work for a company that does not do sales or negotiate on price, so I always chuckle internally when someone asks for a better price. My favourite question is when a customer asks for a Black Friday deal. My response is, "Our prices are the same, no matter what color the day is." That will usually entice a chuckle and end those better price questions. Retailers cramp into a smaller corner every year, with on line specials and earlier openings. Will brick and mortar stores ever go away, with all shopping done on line? I don't think so. Customers need to touch, feel and try many products before buying. I need to see a shirt unless I've bought it before or shoes unless I already have that same brand. I'm partial to Nunn Bush comfort shoes and always order a size 11 Wide. They always fit and are very comfortable. The same is true for mattresses. How can you buy a mattress that you're going to keep for at least 10 years on line or over the phone? You can't lie on your computer or phone, so why bother. Go to the store lie down and enjoy the experience. We don’t keep many items for ten years. So, invest your hard-earned money, wisely, and enjoy the experience of resting on mattresses in a store. Pick your new bed by feel and comfort, not by price. Spending $200 or $400 more to get the perfect comfort level for ten years is not a lot. Enjoy your shopping and don't shop until you drop.